The Liberate XLBT are House of Marley’s first wireless headphones. The headset is the bigger brother of the Liberate on-ear model I reviewed recently. Wireless headphones are becoming increasingly popular, so it is hardly a surprise that House of Marley wants a piece of the action. Hit past the break to find out if the Liberate XLBT headphones are worth your attention and money! The House of Marley Liberate XLBT headphones offer a well-appointed retail package. Inside the recycled paper box, you will find the headset, a microUSB cable for charging it, a 3.5mm audio cable in case you run out of battery, and a REWIND carry bag made from canvas. As far as additional accessories go, you are fully covered out of the box with the Liberate XLBT headphones. This is hardly a surprise considering the premium nature of the headset. The House of Marley Liberate XLBT headphones sport the same design as the on-ear model I reviewed a couple of months back. Premium eco-friendly materials with various textures dominate the look of the headset and make it stand head and shoulders above the mostly plastic competitors in its price segment. 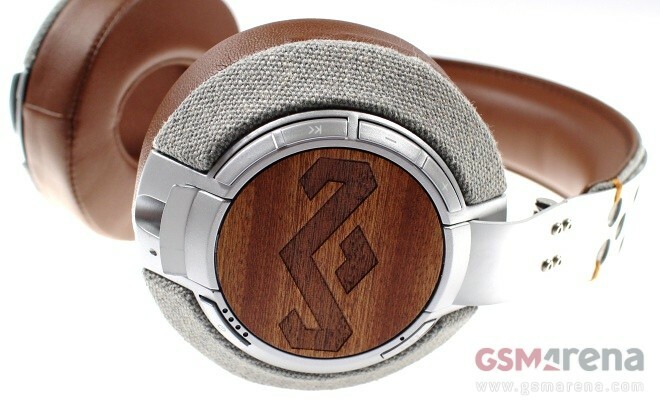 In a true House of Marley fashion, you will find two large logos on the side of the headset that, combined with the materials used in its making, leave little doubt about its brand affiliation. Overall, the Liberate XLBT is a nice piece of hardware to look at and a true conversation starter. There are two color shades that House of Marley Liberate is available in. They include Saddle (grey/brown) like the unit I tested, and Midnight (black/dark grey/brown). Build quality of the headphones is superb thanks to the high quality of the materials used in their making. Tactility is top notch as well – all materials are as pleasant to touch as it gets. The only aspect in the headphones’ build that can use a bit of improvement are the wireless control buttons. The latter are plastic and don’t match the rest of the quality materials around them. With 284 grams of weight, the House of Marley Liberate XLBT headphones are reasonably light for an over ear model. Padding of the headset is generous, so long stretches of continuous use were not a problem. The headset’s wireless controls are located on its right earcup. They include power on/off key and buttons for changing the track and playback volume. A dedicated button for pairing the headphones with a compatible device and battery indicator lights complete the setup. Battery life of the Liberate XLBT is quoted at 15 hours. I’ve been using the headset for a few weeks now and have been averaging between 10 and 12 hours on a single charge – more than enough in my book. House of Marley Liberate XLBT packs beefy 50mm moving coil audio drivers whose frequency ranges between 20 Hz and 20 kHz. Bluetooth AAC with with AptX encoding ensures high quality audio over a wireless connection. In real-life, the Liberate XLBT headphones deliver signature House of Marley sound with stellar quality. In a manner befitting a reggae legend-inspired headset, bass sounds warm and pleasantly natural. Thanks to the large audio drivers on board, the high and the mid-range produced by the headset are well-sorted as well, so long as you have the right expectations. All things considered, the Liberate XLBT headphones are made for bass lovers, not classical music aficionados. The headset does not offer active noise-cancelling. However, thanks to its closed back nature and well-padded earcups, the House of Marley Liberate XLBT does a good job at keeping external noise in check. Audio quality during voice calls is good. House of Marley Liberate XLBT carries an MSRP of $199.99. However, several major online retailers have the headphones listed for $149.99 – quite a bargain considering what’s on offer. A wire-only version of the headset is also available for less than the Bluetooth model. The Liberate XLBT is easy to recommend if you’re on the market for wireless headset and have the budget to pick one up. For comparison, a better-marketed, less-capable Beats Solo2 Wireless on-ear headphones go for an eye-watering $299.99, thus proving that with the House of Marley headset, you don’t have to break the bank to get a premium wireless experience.